Subgraphs can be converted to graphs. The wizard converting a subgraph to a graph creates a new graph. The original subgraph is left untouched. Conversion replaces the SubgraphInput and SubgraphOutput components with SimpleCopy. DebugInput and DebugOutput are preserved too. Only one subgraph can be converted at a time. Select Convert Subgraph to Graph. 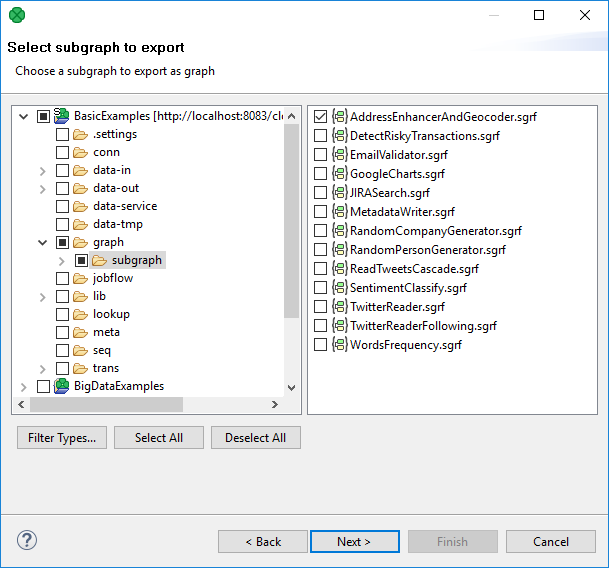 Select a subgraph to be converted to a graph and choose a directory and file name for the graph.